BMW’s rear-wheel drive coupe combines sharp styling with new technology and better connectivity to ensure driving pleasure. The powerful dynamics are underlined with outstanding comfort and sporty style. The refreshed styling leaves drivers with a tasteful coupe that has plenty of get up and go, thanks to an emphasis on turbocharging and downsizing of engines. If you are after a vehicle that offers performance and fine economy handling, you’ll be hard pressed to find better than BMW’s 2 Series Coupe. 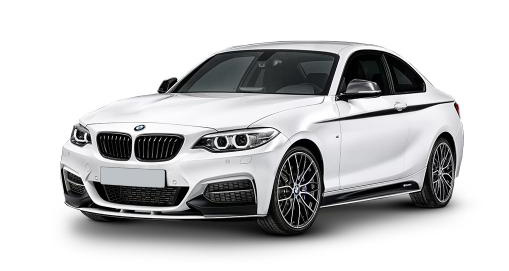 Exterior styling incorporates a larger BMW kidney grille framed with LED headlamps and indicators on a longer and wider body than the 1 Series Coupe, creating a vehicle that’s sold more in the UK than its home country of Germany. Heated exterior mirrors, windscreen and washer jets ensure visibility in all weather conditions and 17” light alloy y-spoke style 380 wheels are encased in run flat tyres to prevent punctures and offer the best ride on all road types. Safety features include a range of Drive Performance Control modes, Park Distance Control for front and rear, rain sensor activated automatic headlights and Tyre Pressure Monitoring with a three-level warning strategy.